So make sure to bookmark this spot and come back from 9 PM – 10 PM ET for our The Walking Dead recap. 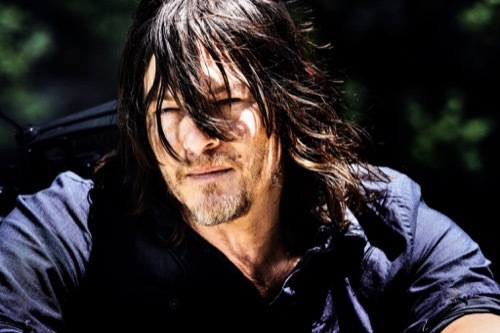 While you wait for the recap make sure to check out all our The Walking Dead recaps, spoilers, news and more, right here! Tonight’s The Walking Dead begins now – Refresh Page often to get the most current updates! Rick holds a young Carl’s hand as they walk down a sunny road. Meanwhile, the Savior prisoners walk down a road while walkers follow them. Rick is in checking on the baby. He stops and stares at himself in the mirror. Siddiq comes in with a bottle for the baby. Rick asks him to tell him how it happened. Rick thanks him after. Gerry sits and sharpens his sword while Ezekiel comments on a sunny morning they are having. He is thankful even if it may be some of their lasts. Morgan begins running. Carol chases after him. He darts at Henry. Carol stops him. Morgan is hallucinating. The prisoner Saviors come to the gate. They are let in. Rick tells them all to get ready. The first group is leaving in 20. He pulls Morgan aside and tells him he should stay behind. Morgan wants to just finish this. There is no going back, he tells Rick. The gates open and the first group leaves. Eugene and Gabriel come into the warehouse. They see Negan talking to Dwight who is shackled. Negan tells the other Saviors to load him up. Eugene brings him some bullets. He tests them out. He is happy. He tells more Saviors to load it up. He tells Gabriel he should come for the ride. He has some things to confess. Rick, Carol, and the others take out a group of walkers and Saviors on the road. Meanwhile, Negan is confessing to Gabriel in the car how he has set Rick and the others up. The roadblock is fake and so is the map they will find. They will think they are on the right track but when they show up to get Negan, he won’t be there. That is the real trap. Gabriel opens the car door and jumps out. Gabriel stands up and runs for it into the woods. His sight is bad. He bumps into a tree. A walker comes at him. Laura comes out of nowhere. She kills the walker. Eugene comes running at him with a gun. Negan is behind him. Negan takes over the reprimanding from Eugene and hits Gabriel in the stomach with his bat. They load him into the car. As the group walks, Jesus talks to Morgan about killing, and how things will get better. They come out of the field and hear whistling. Negan’s voice comes over a megaphone. He tells them he is going to ambush their ambush. Negan tells them that today is possible thanks to Eugene. He also has Gabriel and Dwight at gunpoint. Negan commands the Saviors to show themselves on the horizon. They all shoot but their guns backfire. Something is wrong with the bullets. They all scream at Eugene. Rick and the crew charge at them. Gabriel and Dwight both rush Negan. He runs. Tara and the others fight not too far away. Suddenly and an explosion occurs in the area she plans to shoot. She looks to see Aaron and the ladies of Oceanside. They have come to fight. Meanwhile, in the field, Laura and several other Saviors have dropped to their knees with arms in the air. They tell Michonne, Maggie and the others they surrender. They chase each other around a tree that has a stained glass ornament hanging from it. Rick shoots at the glass. They finally come into contact with one another. Negan and Rick punch one another. Rick jumps on him. Negan gets up and punches Rick in the gut. Rick falls. Negan grabs his bat. He tells Rick if he killed him earlier maybe Carl would still be alive. Rick kicks him hard. He hits the ground. Rick asks him for 10 seconds to tell him about how Carl thought they could have a future. They don’t have to fight anymore. They both stand. Rick begins to talk about Carl and quickly slits Negan’s throat. He looks down at his hand holding the glass shard. He has blood everywhere. He looks behind him. A crowd has formed. They are all watching. Rick yells to them to save him. Siddiq runs down the hill. Maggie yells no. He killed Glenn. Michonne holds her back. Rick addresses all of them. He tells them all this fighting is over. There will be a new world and whoever doesn’t obey will pay the price. Rosita asks Eugene if he purposely sabotaged the guns. He tells her he did. She punches him for puking on her. Morgan gives his things to Carol and tells her to tell Rick he will be okay. They all head home. Rick stays sitting at the tree. He cries. Later, Daryl brings Dwight out to the woods. Dwight gets out of the truck and he tells him he knows why he is here. He is ready to accept what he gets. He is a piece of sh*t. He gets on his knees. Daryl throws him keys and tells him to stop. He tells him to leave and never come back. If he does he will kill him. Morgan stops by to see Jadis. He tells her she can come back to the community if she wants to. He introduces himself. She tells him to call her Anne. She will go get her things. He tells her she can go ahead without him. He needs to be alone. Rick and Michonne talk to Negan while he lay with his throat wrapped in the infirmary. They tell him that he will watch from a prison cell as they rebuild a new world. He will be an example. Gabriel kneels to God and thanks him. Rick walks a young Carl down the road. Rick recalls the feeling he felt that day. He tells Carl that he didn’t know at the time that he was being brought somewhere, to the new world.